There is no doubt that when it comes to cocktails, the Cubans perfected the craft years ago. So when I discovered a Cuban-themed cocktail bar in the middle of the city, I couldn’t wait to see if the rumours were true. Fidel’s Copenhagen is conveniently located near Kongens Nytorv and Nyhavn, serving a variety of fresh fruit-based Cuban classic cocktails and more. Going through the big doors of Fidel’s was like entering a world suddenly 30 degrees warmer. The bartenders gave us a warm welcome and I could not help but notice their exquisite interior design straightaway. Vibrant lighting, fancy chandeliers and sophisticated furniture adorn the venue along with posters and pictures taken in Cuba hanging on its walls. The entire area was glowing with red lights that gave the place a rusty, mysterious vibe. Along with the palm leaves surrounding the entrance, there’s an unmistakable Caribbean essence permeating through the two-floor, two bar premises with room for 350 guests, which is just as well as everything about this place makes you just want to dance. The menu was jam-packed with lots of different cocktails to try. 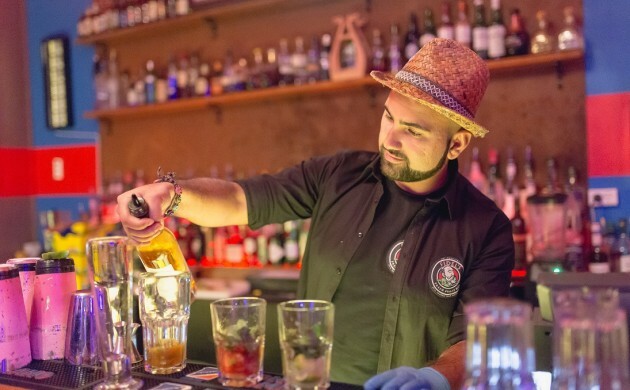 Fidel’s bar manager Aryos Muhsin explained how the venue always tries to provide as least one variation of every cocktail. We wanted to see what he was talking about so we opted for two kinds of mojito. Given the bar’s Cuban flavour, the expectations were high for this drink: it would make or break our visit. We had a classic mojito and their famous twisted mojito. Both are bestsellers so surely they wouldn’t disappoint! The twist in the twisted mojito is the addition of Strawberry liquor and white balsamico. Who knew that having a hint of vinegar in your cocktail would actually be so refreshing?! Both drinks were amazing, but the twisted mojito really stood out. There was a different kick and I liked the creativity with the flavours they combined. Another hit was the ‘Passion Kiss’. It was a mix of vanilla vodka, passion liquor, black-raspberry liquor, passion fruit, kiwi, cranberry and vanilla – a wonderful use of fresh fruits. The acidity and sweetness combination was a perfect match, and that’s coming from a girl who likes it sour and sweet. My companion absorbed every drop of his drink as if he could not get enough of it. I absolutely didn’t judge as I wanted to savour every sip from mine as well. Everyone is definitely guaranteed a splendid time at Fidel’s. The live and upbeat environment they provide for everyone is so warm and welcoming, there’s no possibility to not enjoy it. Even if it’s just for a quick business chat or catching up with friends, there’s no better place to be. It’s not just your ordinary cocktail bar as it also transforms into a nightclub once the DJ plays his fine beats. A variation of music is available: Cuban, Latin, reggaeton and pop will surely get you dancing.